My lovely lady and I DJ 3 days a week. There is something I always find fascinating, after singing a few songs people are always on a much better mood. Even those who come in with a terrible outlook. I have also heard my lady’s lovely voice break out in song when she is in a great mood. This leads me to one not so shocking conclusion, people are happy when they are singing. Above is a picture of Winnie the Pooh and a song he sings. I have always been a fan of this bear from a young man on. Very simple, laid back in short my kind of man…er…um… bear. You would be surprised what you can learn from reading these childhood stories as an adult. 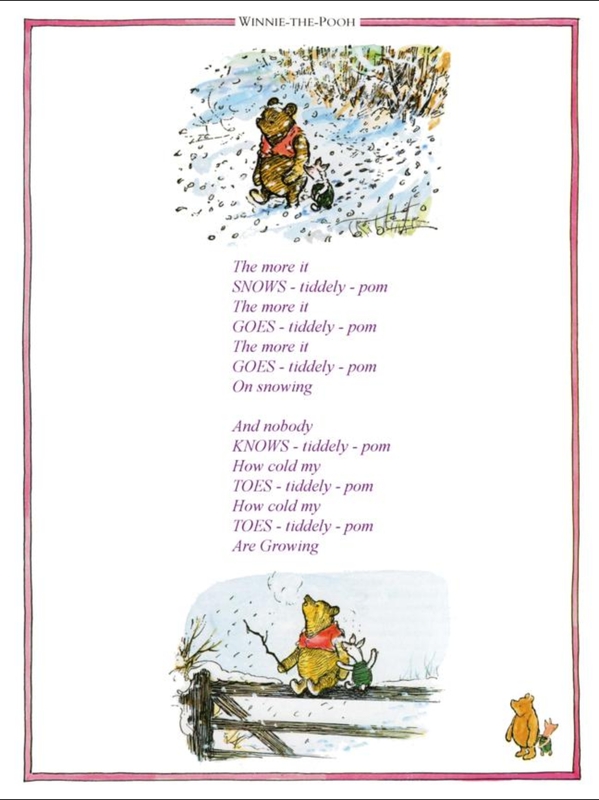 In fact, I would recommend checking out the book The Tao of Pooh when you get a chance. Back to the point of today’s post. I suggest we take a lesson from this lovable bear and develop our own song to sing when we need a little uplifting. Don’t worry you can even sing it to yourself if you are self-conscious. It need not be complicated and it only has to make sense to you. What if you are not that creative? Fear not, find a simple song you enjoy and use that. Soon enough you may find your own inner song. I am Native American and we have songs for many different purposes. Some that give you strength when you feel down, some to honor veterans etc. I suggest trying to write one for yourself. It is easier than you may think. Just try writing down things that make you happy and then just try to work them into a simple little song. Again, this will not be heard on American Idol or by anyone in the music industry it is just for you and your happiness. When life has you down, having a little song to sing either out loud or even hum to yourself about all the things in life that make you happy can do wonders. It may seem silly at first, but even that should bring a smile to your face. As an extra bonus try throwing in a few things you are truly grateful for. Feel free to share how this works for you in the comments below.